Have been with Dr Harris more than 8 years, very happy with him. very helpful for any time needed. 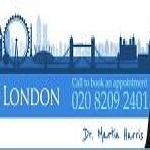 Dr Harris provides a very reassuring expertly delivered service. His vast experience in this most delicate of procedures is worth the expense. Our second son has had nothing but high quality care and for this we are satisfied and grateful customers. We are happy with finding friendly surgery looking after me, my family and all the needs of patients. Private GP in London provides professional medical services for families and visitors. Examination, investigations, Tests, reports and referrals.